In the previous post we got our hands dirty and started coding a small demo application around MassTransit. We managed to send a message from a publisher to a consumer using the MassTransit/RabbitMq client library. We saw a very basic configuration of the bus control and how to register a consumer for a message type. The message type can by convention be an event or a command. Both are best encapsulated in an interface with get-set properties and separate naming conventions. Therefore commands and events are not some special C# language features in this case. Instead, they are basic terminology in the world of messaging. Our first example centred around sending a single command using a single queue. In this post we’ll extend our demo to publishing a message that can be consumed by multiple receivers. The goal is to publish a customer registered event from the register customer command consumer. The event will be consumed by 2 receivers that the event publisher will not have any knowledge of. It has some of the same properties as IRegisterCustomer. When a new customer is registered then we won’t publish all the details to the consuming parties. We’ll have 4 command windows up and running when starting the demo at the end of this post so it’s good to have an easy means of identifying which window belongs to what. Note that we didn’t have to specify a queue name here as opposed to sending a command to a single queue. We’ll see that the queue names are only provided in the consumers. MassTransit will create the necessary queues in the background. This is nothing new compared to what we saw before. Note the queue name in the ReceiveEndpoint extension method. The real beauty with such a system is that MassTransit.Receiver has no knowledge of the actual consumers of the event. It only publishes the event and then it’s up to the various other projects to sign up. New consumers of the event can easily sign up or also quit being notified, the event publisher won’t care. We didn’t have to couple the publishers and consumers in any way. The only coupling is the queue name between MassTransit.Receiver and MassTransit.Publisher in the GetSendEndpoint method, otherwise there’s not even a project reference among them. I think this is one of the most important advantages of a distributed system based on messaging and it’s good that we nailed it down so early. We’ll continue with dependency injection in the next post. View the list of posts on Messaging here. Hi andras, I’m a begginer to using message brokers and have a question. We have a ticketing service which has multiple sub service. A supervisor service get any request from web API and send them to sub services. 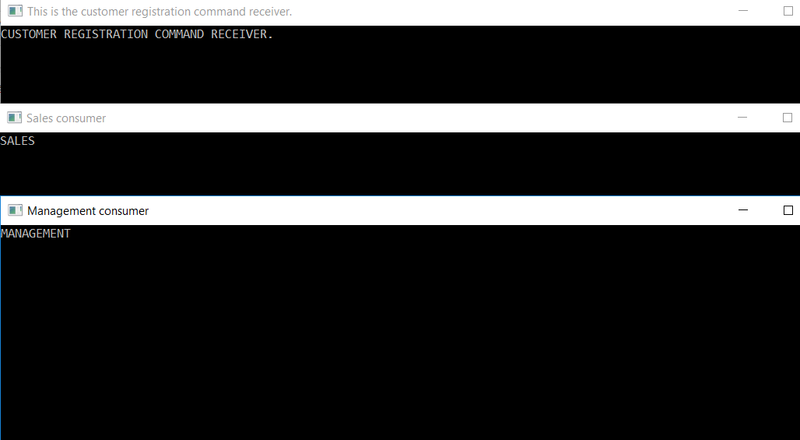 Any request has a header which use to detect command type (suc as Reserve, Refund, Availability or etc. ), then deserialize to object and using it. Now, Who to send various command type by MassTransit from a publisher such as our supervisor and get them in consumer and use it? I need help. I was created the solution as you shown and everythig works fine, but there is one issue. The RabbitMQ alway creates additional queue which name ended “_skipped”. But solution works as expected correctly. Please, answer the questions: What is the queue “_skipped”? Is is ok or where I was wrong? “For the receive endpoint, it … perhaps not consuming the correct message type. The message type must be the same message contract in both the consumer and publisher for the message to be consumed by the consumer.